It is just about time to welcome students back to school! First day jitters are a real thing for many students, so I like to greet my kiddos on the first day with some sort of small gift. I feel like it sends the message that I am so happy to see them and I'm excited for our time together. These gifts don't need to be expensive. Here's a round-up of some of my favorite inexpensive (or free!) welcome back gifts for students! ♥ These fun glow wands are always a hit with my students!! Just print, trim and tape to the end of a small glow bracelet! ♥ Psst... these are also a great way to encourage your students during testing time! 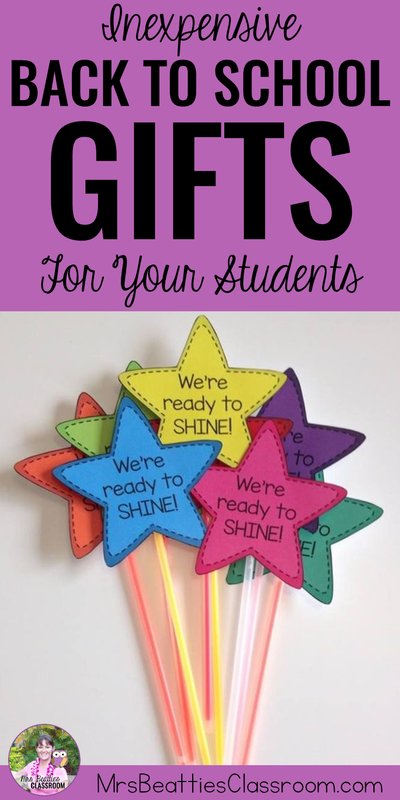 This adorable gift will definitely leave a mark on your students! These goldfish tags will make your kiddos the coolest in the school! Wish your students a Marvelous & Magnificent year with these cute printables! These tasty chocolate-covered apple pretzel treats would be a hit with every kid I know! If you're a creative type, or have a daughter who is into making friendship bracelets, your students would definitely knot turn these down! These treats would be super for a superhero-themed classroom! Everyone could use a new pencil! Why not grab some cute ones at the dollar store and add these little tags?! You could welcome your students with a BANG with these fun tags on a package of Pop Rocks! If you have a little time on your hands and want to tackle a REALLY cute idea, check out these Rolo pencils! They are awesome!! These are perfect for those little packages of wedding bubbles! How can bubbles NOT put a smile on your face? !